Wait, so who are the carbon ceramic brakes meant for? Salespeople will likely ask those configuring their new Porsche to upgrade to carbon ceramic brakes. This is no easy decision to make because ceramic brakes aren't what we'd call cheap. On the latest 992 Carrera S, they come as an $8,970 option and are even more expensive on a GT3. You may think because you don't plan to track your car that you don't need to opt for the better brakes or that the inverse is true and the ceramic rotors will provide better braking force during your next track day. 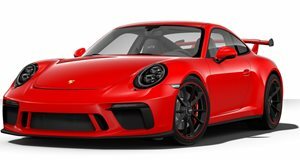 In reality, the reverse is true according to an interview by Wheels magazine with Paul Watson, a technical representative for Porsche Australia. If you do plan on taking your Porsche to the track, you should NOT opt for the ceramic brakes. Watson said, "if you're doing club days we'd always recommend iron discs." He explained that "ceramic discs can degrade if you're hard on the brakes" and the "heat build-up will degrade the carbon fibers in the disc." Porsche originally marketed the carbon ceramics as the ideal option for track buffs because they provide better stopping power and last longer than steel brakes. When owners put these brakes to the test on the race track, however, it was discovered that Porsche's initial predictions on brake wear were incorrect. "When we first launched the discs we told people they'd last virtually for the life of the car and people were doing a number of track days and coming back to us saying 'I've worn them out,'" Watson said. If the carbon brakes are used primarily for street use, they can last for thousands of miles, possibly even the life of the car. If you check out Porsche owner's forums, you will see plenty of discussions on the carbon ceramic brakes. A consensus has been reached in the Porsche community that the carbon brakes are simply too expensive to replace when they get worn out, so most of the owners who track their cars opt for the standard brakes. So who exactly are the carbon brakes for if not the track day buffs? Watson said the ceramic brakes are great for "People who don't like cleaning their wheels. They don't leave a build-up of brake dust, so that's an advantage."